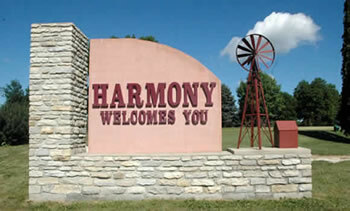 Harmony is a great little town to visit and it has all the things that make a town great. It has fun with the Niagara Cave and their 18-hole mini golf, the Amish community, the Harmony-Preston State Bike Trail, a movie theatre and even roller skating. Harmony has many dining options for everyone including fresh options, burgers, steaks, salads, pizza, pies and ice cream. It also has the things that make a town great to live in including a grocery store, a pharmacy, bank, post office, clinic, nursing home, assisted living and convenience store. Whether you are staying at the Country Lodge Inn to visit family and friends, in town for a wedding, or here to visit the area, we are a great place for your lodging needs.